Whether you feel totally out of control or just need to manage your time a bit better, the first thing you need to do is know yourself. Figure out what works for you and then work on disciplining yourself to do it. Learning what works for you may take a lot of trial and error, and it will definitely take some introspection. Most people overlook the fact that productivity methods are not cookie-cutter solutions. A lot of years ago I was at a staff meeting at a school where I worked in which we had to get into groups and share a “best practice” that we utilized. It didn’t have to be classroom related, it could be anything in work or home life. I remember exactly one lifehack from that meeting. A lady in my group shared that whenever she went through a carwash, she used the time to wipe down her dashboard and tidy up her front console. It’s a small thing, but I remember it, and I could not tell you what one other person in my group shared. Why? Because for some reason it resonated with me. As you explore productivity methods, you’ll find some that make you cringe and others that resonate. Lean into those. That’s definitely a place to start, but chances are you’re still only going to find a few methods that way. I have a couple of other things I would refer you to try out. 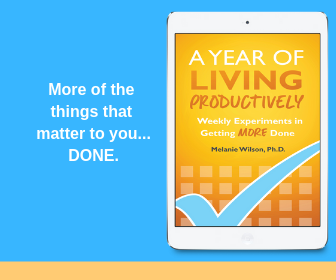 Melanie Wilson is a PhD turned homeschool mom who experimented with more than 80 methods to increase productivity in her own life. She’s sharing her experiences, along with a condensed description of each method in her book A Year of Living Productively. I found this affordable ebook so helpful! I could scan each method and if it resonated with me, go back and dig in a little and read more. Then I could try the methods that I felt might work for me, knowing that if it didn’t work, there were tons more to learn about. I’ve had this post planned for some time, so when I got word that one of my favorite companies–the ladies at Ultimate Bundles— was putting together The Ultimate Productivity Bundle, I knew I needed to include it. They are experts at gathering a huge amount of resources and offering it at an insane price. I have never been disappointed. With this bundle they have helps for time management, home management, work management, goal setting, planners, and more. You will definitely have loads of methods to sort through and see what resonates with you with this bundle. No doubt! We’re spending this month looking at how to make lasting change by changing one habit at a time. How’re you doing? 2 – Daily Bible reading can be hard to be consistent in. Find a Bible reading plan that works for you. 4 – Christian weight loss help for the one who is ready to forget past failures and finally lose weight for good. What have you done with your freedom? Stephen, I am with you! I don’t often stop and really think about my productivity and what that means, but when I do I am pretty much always reminded that I need to do better. Glad you stopped by! So many great resources and suggestions! Very helpful! Melissa McLaughlin recently posted…From Clay to Heaven – Be Amazed by Your God!